I love Emerson’s quote, don’t you? A laughing Mother Earth is a delightful idea … but how to define her sense of humor? It’s got to be very refined, how else to explain the grace and beauty of flowers the world over. I cannot come up with a single example of a natural floral display that might be called garish, the result of a belly laugh. Garish is achieved later, with human intervention (visit your local supermarket “florist”). And, I find it hard to believe that Mother is someone who titters, squeals or snorts, and a guffaw would be unseemly. No, Mother keeps it classy, her mirth and the resulting floral output elegant. Have you ever seen a field of wildflowers in the spring? I can think of no more pure example of Mother at her most festive, her laughter ringing and joyful. 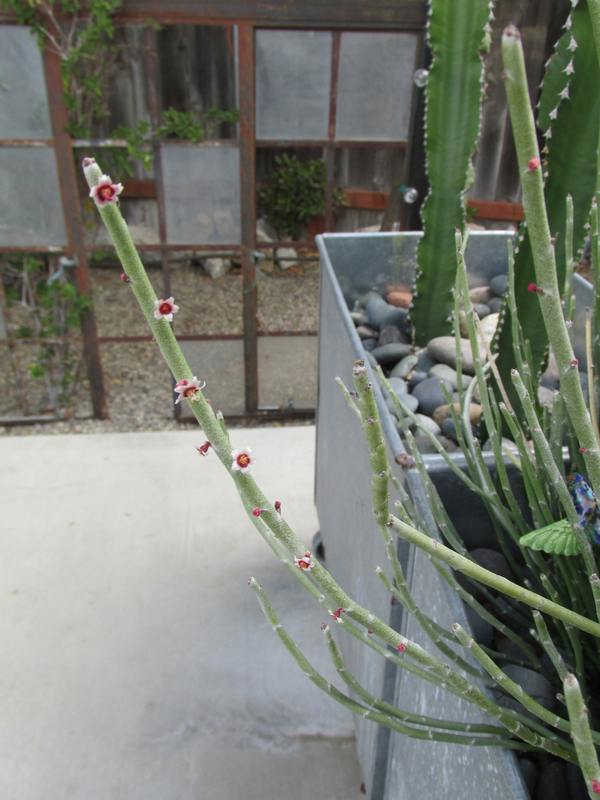 When I first spied these black buds on my gorgeous blue cactus I was alarmed. I thought it a sign of disease. I kept an eye on them and was soon rewarded by the sight of delicately colored flowers: Outer petals tinged with mauve, their interiors fringed with a pale gold dust bees find irresistible. This little worker was so besotted by his blossom’s charms he ignored me completely. 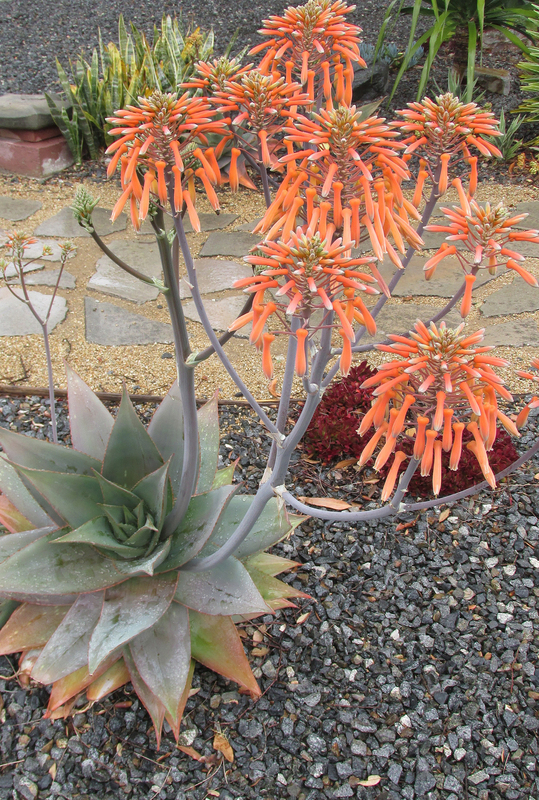 Aloes may seem run of the mill, but I cherish mine. Every firework blast of coral blossoms is a new miracle for me … They’re not saying, but I think the local hummingbirds feel the same. They simply can’t stay away. I honestly can’t remember the name of this plant but I love it very much. I included it here because its flower — please tell me it’s a flower — is so interestingly odd. Here, a clingy drop of rainwater is adding to its strangeness. This little fellow has stood at the feet of the tall blue cactus for years: Stout and standoffish, boasting only a coat of tight gold spines. 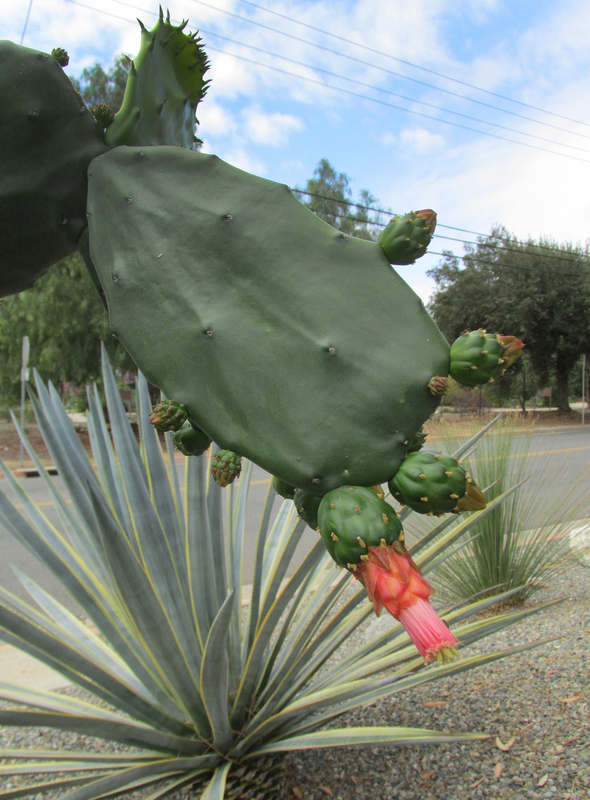 Now, all of a sudden he’s broken out with a crown of magenta buds, giving me a reason to check him out daily. I have to see the buds in full bloom! 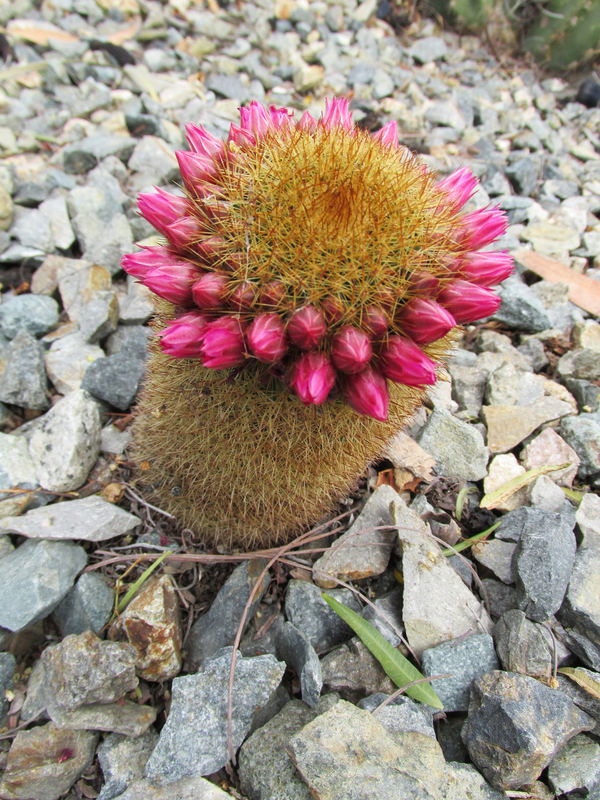 I’ve not been successful at catching this cactus’ blossoms open: They’re either tight buds ringing the oval pads, or fallen and shriveled on the ground. I feel fortunate witnessing this much of the blooms. The layered and delicate colors suggest a festive fiesta skirt yet to be unfurled. 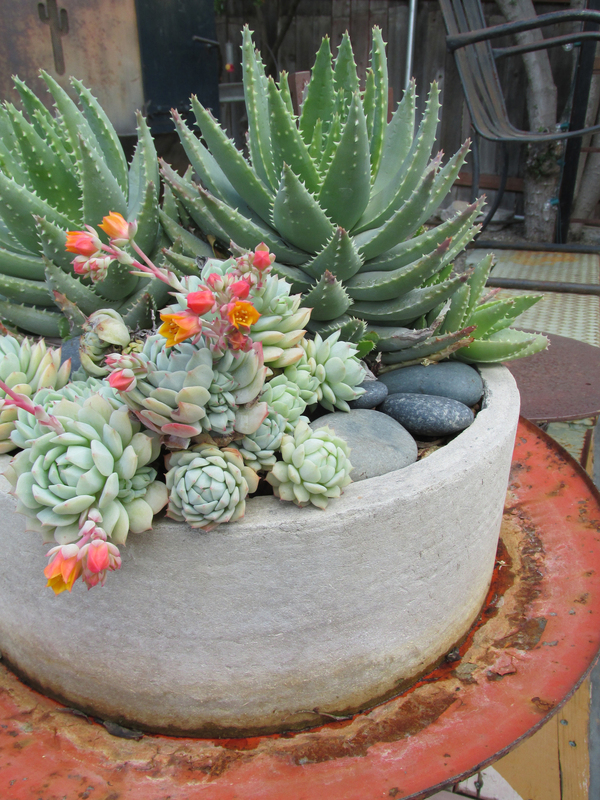 These plants have been in their pot forever it seems but only now have they bloomed. Deep coral, with French’s mustard interiors, these blooms and the plant they sprouted from have an almost-plastic squishiness about them I love! Talk about tiny, the flowers that appear along the stalks of this grass-looking succulent are just barely ⅛th-inch wide. Although they feature a simple 5-petal form they’re subtly colorful with gold centers and petals fading from deep red to white. 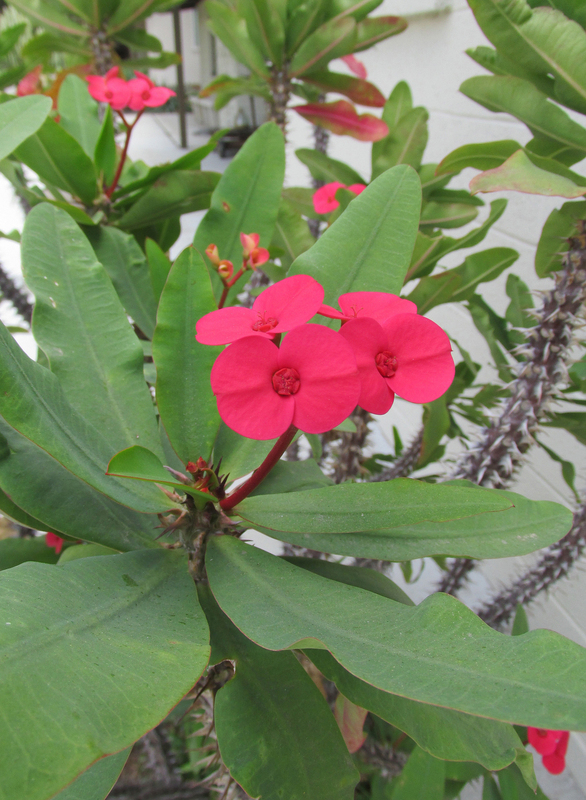 This crown of thorns, a gift from a neighbor, is a purist, plain and simple. Its flowers are one color and one color only: Magenta, er, crimson; maybe scarlet? I guess it’s more of a fuchsia, really. In any case I appreciate its simple symmetry. More tiny, simple-colored blooms … And another bee magnet; these blooms almost went unnoticed at the rear of property, on Redwood Drive. This plant’s spines are deadly sharp but no problem for buzzing worker bees intent on their performing their assigned duties. From their bed in the cradle of a former hog oiler, these dainty butter-yellow bells will ring us out of our floral reverie. 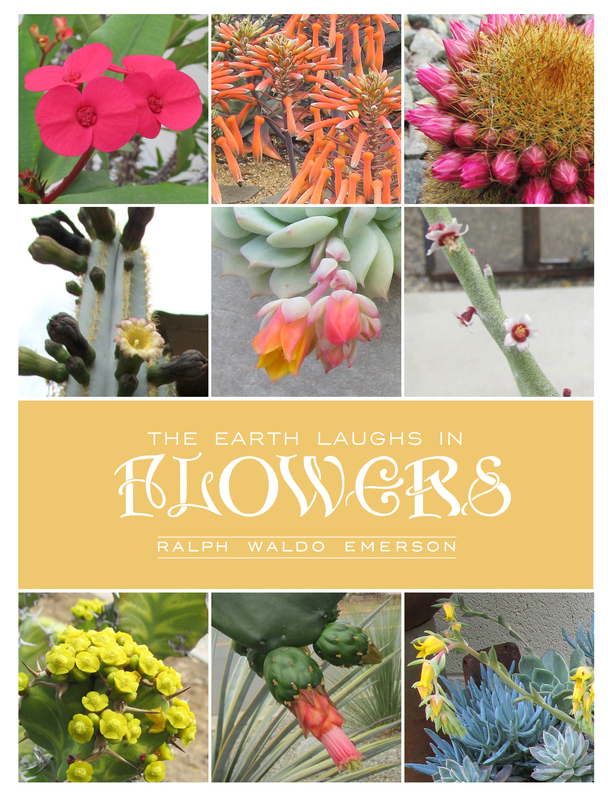 I may not be privy to the punchlines that caused Mother Earth to laugh these flowers into existence, but they must be delightful. How else to explain the resulting flower’s diverse loveliness. 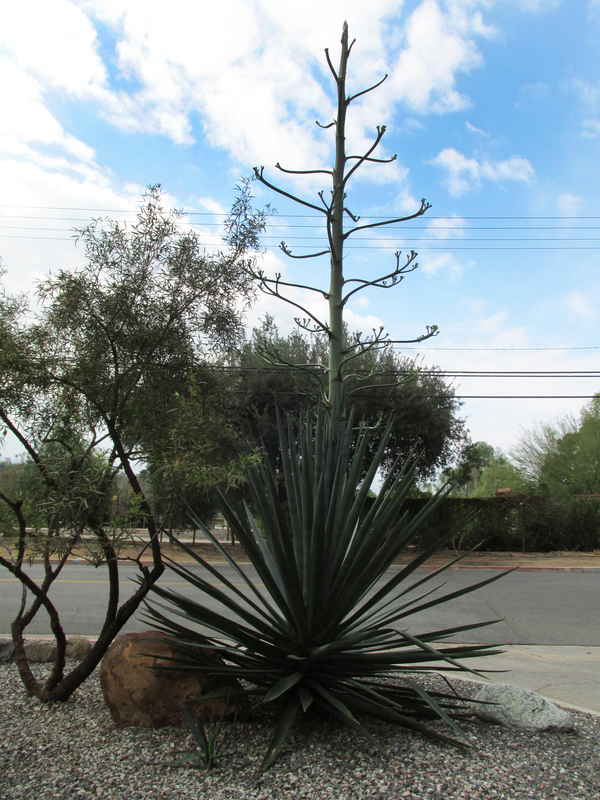 The octopus agave has taken on an even more pronounced undersea look, and its central stalk has added 4 or 5 feet since I showed it last. Seemingly overnight it’s taken on the look of an inquisitive underwater serpent. 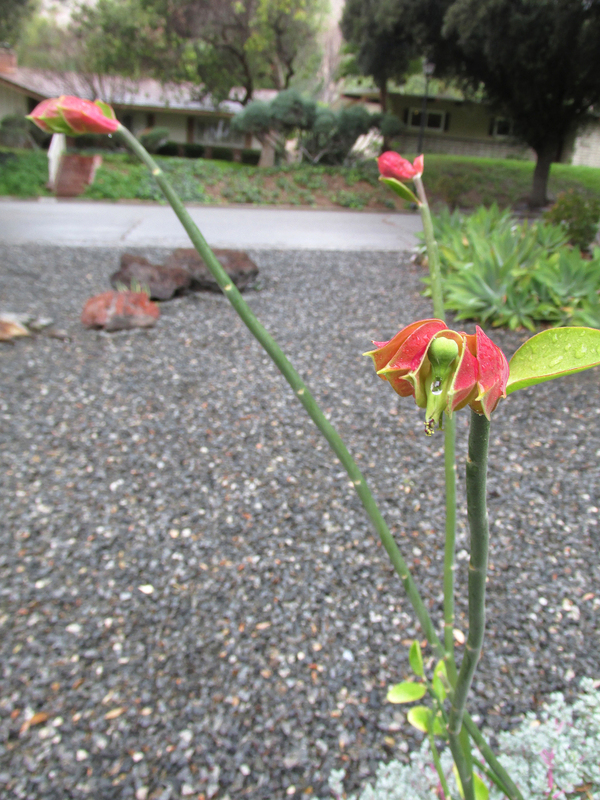 I think once the buds along the stalk open it will not look as sinister. 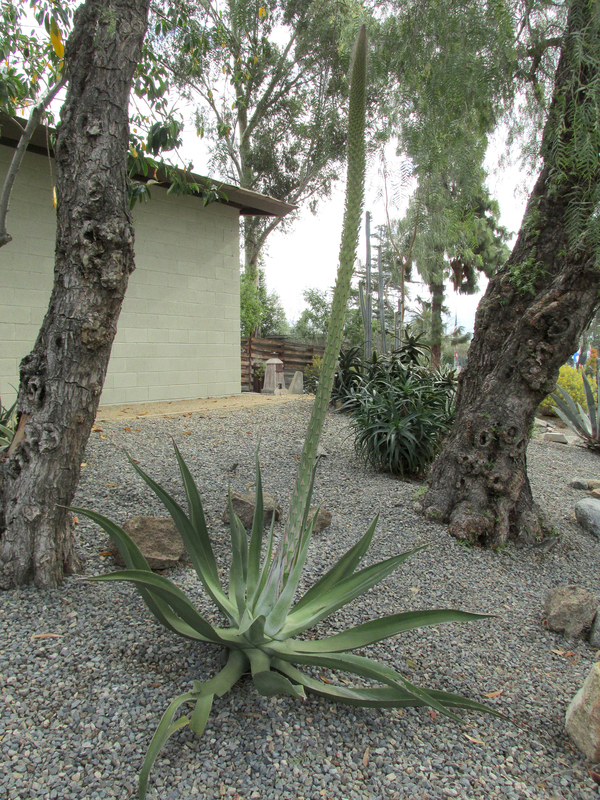 The stalk of the giant agave, above, no longer looks like an asparagus stalk. It’s even taller, and sporting more branches tipped with tight buds. I’m hoping that between now and that grand opening a way for me to photograph them will present itself. I wonder how pricey it’d be to rent a cherry picker? 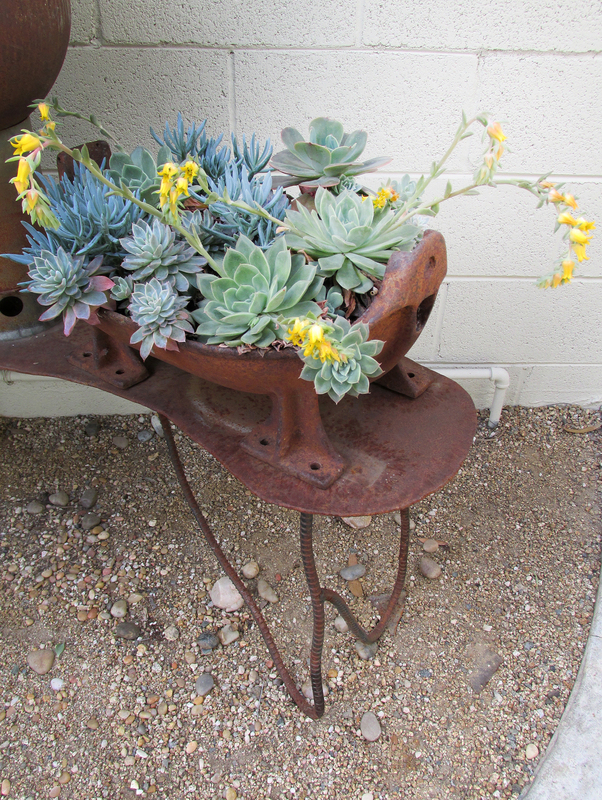 I am in LUST with that blue cactus with the black blossoms. So beautiful! The cool plant whose photo is under the blooming aloe is Pedilanthus bracteatus (slipper plant), and it is awesome. 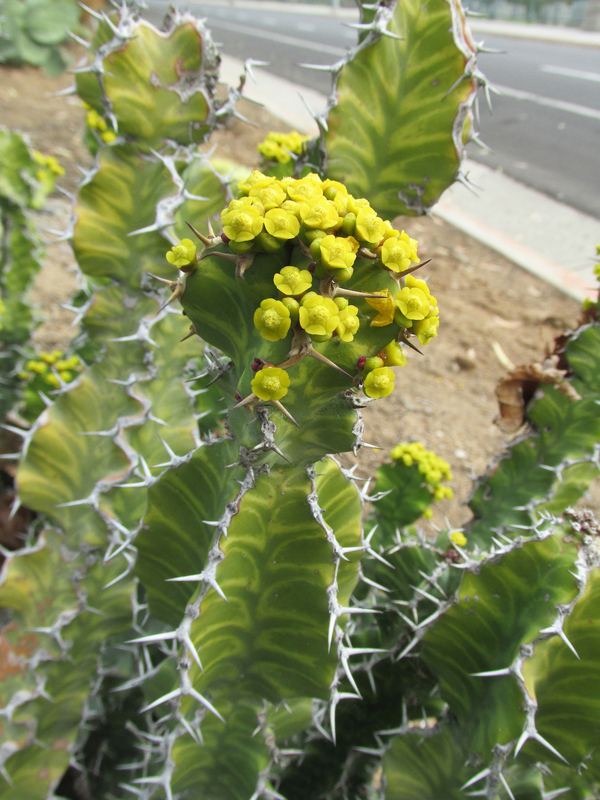 Unfortunately not hardy in my Yucaipa foothill temps :~( The wonderful grass-looking succulent is Euphorbia antisyphilitica. The email I sent to you (via my gmail account) explains why I know these names! So beautiful! I do like the contrast on some of these strange looking plants and the beautiful blooms they produce. That contrast between bloom and plant is what I enjoy most about them, Vickie. Oh, and the surprise factor: Nothing like a surprise bloom! Oh my gosh… so beautiful! I need to come by and see you and your garden… it’s been way too long!! I’d love to see you, WF! Let me know when you’ve got time. Hi, Denise, that’s what I decided my blue cactus is, too. But with the black buds and the flower shapes I’m not entirely sure; they’re not a total match. Whatever — I love them. They’re now becoming alarmingly tall and I fear they might fall over in a strong wind … thanks for commenting! Thanks, Pam … I missed the page included with the link. Now if only I could remember the name moving forward!